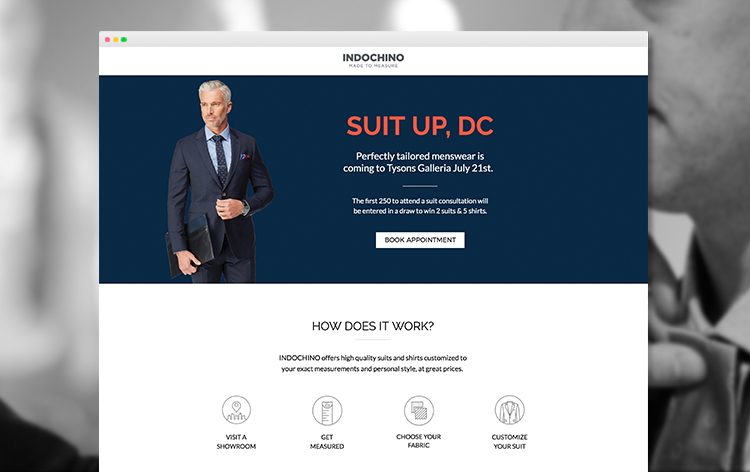 Similar to how Indochino is revolutionizing menswear with made-to-measure suits, it turns out a custom fit applies to their digital marketing too. In the past year, the fast-growing apparel brand saw over 50% growth in retail, and opened nine new showrooms across North America. The brand’s marketing team of just 12 people are used to acting fast, but until about a year ago, the team faced a bottleneck threatening their nimbleness and the effectiveness of their PPC ad spend. As Lisa Craveiro, Director of Acquisition told us, the company’s blog and website CMS templates couldn’t be easily customized to suit their pay-per-click needs. When Lisa’s team needed to publish relevant content (for pointing paid ad traffic to), changes to the site couldn’t be published fast enough. First, they experimented with mock editorial pieces created in Unbounce to better convert Facebook ad traffic. And second, the team built several location-specific landing pages for marketing different showrooms and educating prospects on their unique customer experience. 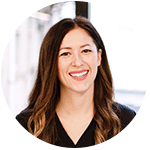 Over just nine months, Lisa’s team secured 800+ showroom bookings via their new Unbounce landing pages, 40 online transactions of purchased suits, and 750 newsletter signups. 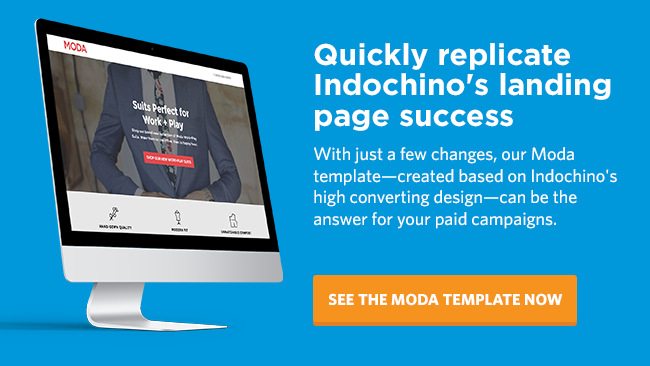 Having over 340,000 visitors directed to a landing page as part of their paid media strategy is just one aspect of how Indochino’s scrappy marketers have been able to grow the brand’s selling appointments 77% year over year. Read on for a peek into their playbook. But sending paid traffic to the brand’s blog or site-specific web pages wasn’t a good option as recent as a year ago because the marketing team had little control over the experience. And so Indochino began using Unbounce in a fairly unconventional way. Alongside a designer, the team created mock editorial articles for their Facebook ads to point to. These articles — fashioned to look like blog posts — contained calls to action to “schedule an appointment” in a showroom, but also to “see the suits” for those preferring to browse. With over 64,000 visitors via their ads, this ‘mock’ article converts at 17.40% with thousands of people clicking through to see showroom locations, go to the website, or see sample suits. 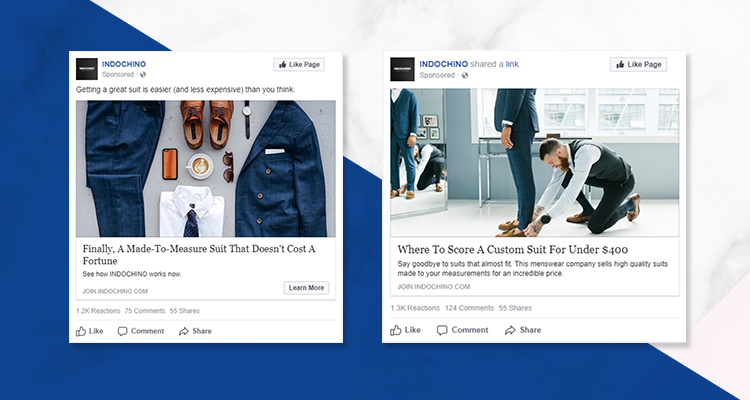 These articles (built in just a few hours) not only provide an especially relevant destination for anyone arriving from a Facebook ad, but they also allow Indochino’s marketers to communicate different value props quickly based on different ad messages. For example, the brand knows the showroom experience is very valuable and that many men become lifelong customers based on their unique experience being fitted. This listicle style piece converts at 29.63%. The CTA prompts visitors to book an appointment. 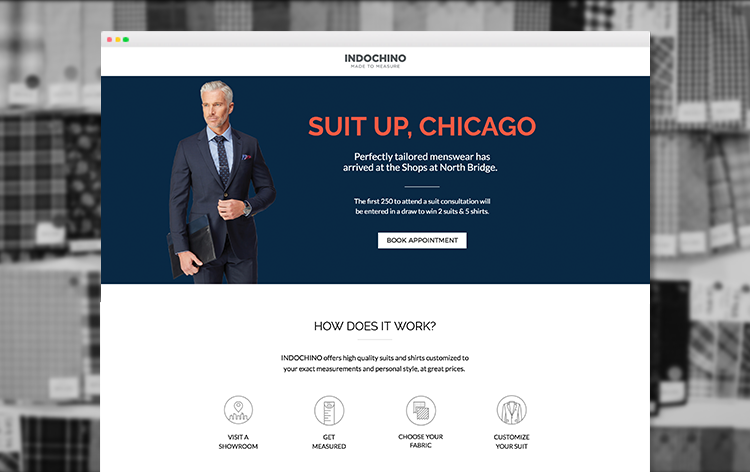 On the topic of nine new showrooms launched in North America this year, as Indochino found, once you introduce a new product line, or— in this case—a new retail location, you can’t always update your website right away with location-specific content. 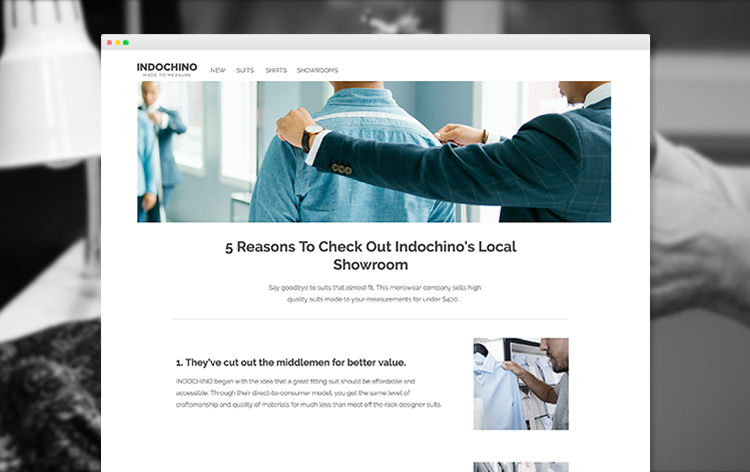 So instead of relying on developers to help update their site with pages specific to each new showroom launch, Indochino turned to landing pages. They created several location-specific pages to explain their fitting process and speak directly to potential customers in a given area. This page, where you can book an appointment or ‘see the suits’, converts at 19.38%. 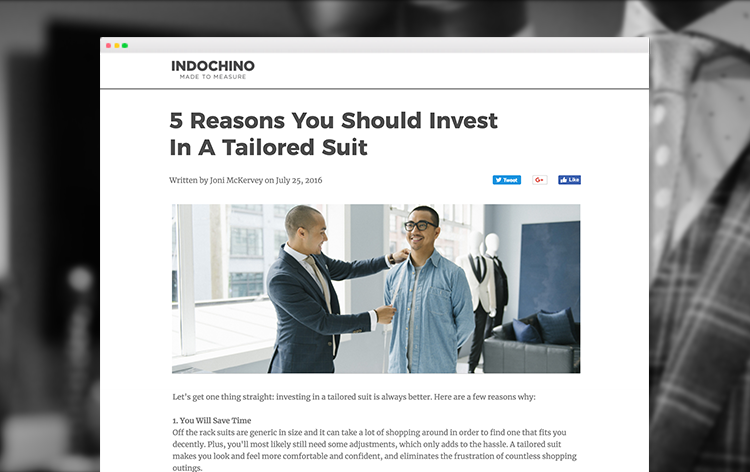 These location-specific pages allow Indochino to get really granular with the targeting of their ads, and the message prospects see upon click through. There’s strong message match from ad to landing page, and visitors see specifics to their location which helps fulfil the promise of the ads. Want to run location-specific ad to landing page combos like Indochino? Try Dynamic Text Replacement. This Unbounce feature swaps out select keywords or text on your landing page with the exact terms someone has searched, like their location. See a preview of how this works here. 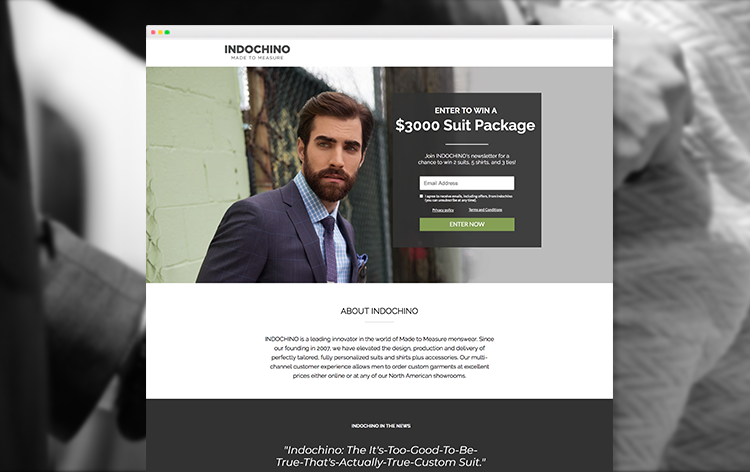 Beyond highly relevant Facebook ads and location-specific content, Indochino also uses landing pages for lead generation; often for contests and partnering with wedding vendors like The Knot and others. On a whole, taking control of the experience after someone clicks an Indochino ad has proven very valuable for this fast-growing menswear brand. By serving up especially relevant content, they’ve seen their paid Facebook posts perform especially well.